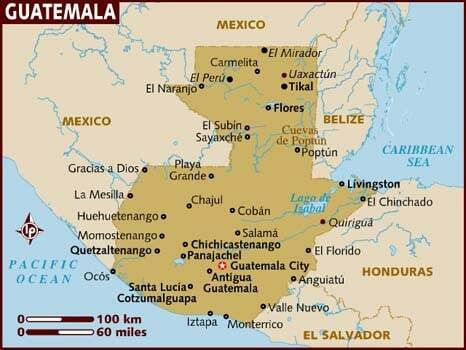 I’ve traveled through many parts of my adopted country of Guatemala, but had never explored the eastern area. 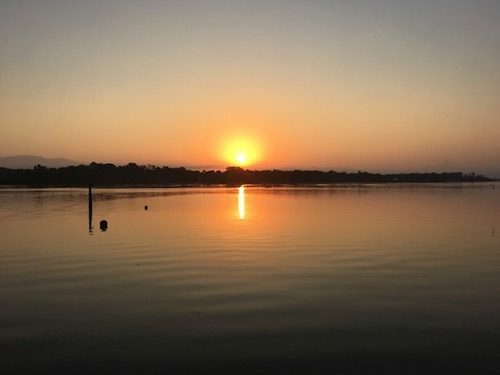 A destination high on my “must visit” list was the Rio Dulce, the river that flows from Guatemala’s largest lake, Izabal, into the Caribbean. Since we had headed east from Lake Atitlán to Copán, Honduras, we decided to swing north to the Rio Dulce. We booked two nights at one of the many river lodges that support the Rio Dulce’s tourism. The Rio Dulce is considered the safest “hurricane hole” – a safe area during hurricane season – in the Western Hemisphere. Cruising sailors visit the area year round. Mark next to a stela at Quiriguá. It’s pretty casual… a worker left his rake in front of the stela. Our “must do” stop on the way to the Rio Dulce was the Maya archeological site of Quiriguá. 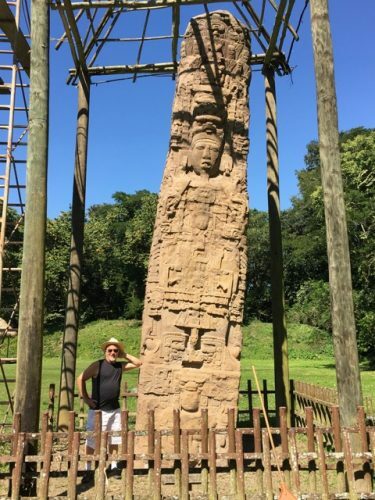 While smaller and less known than the archeological parks in Tikal and Copán, Quiriguá is a UNESCO World Heritage site with impressive and remarkably well-preserved stelae. While Mark was driving, I read Wikipedia’s article about Quiriguá, which prepared us well for the visit. It was the highlight of our day. The park is only a 10-minute drive from the main highway (CA9), in the midst of banana plantations. The entrance fee is negligible. There’s a small parking lot, a few vendor stalls, and a small museum. The path through the plaza to the acropolis is well-maintained and takes you past the amazingly tall and well-preserved stelae. The hard limestone allowed sculptors to create much taller stelae than in other locations. We walked all through the lush, green park, which took only about an hour. Quiriguá was well worth the stop. On the road again, we drove from Quiriguá to the Rio Dulce in about an hour. 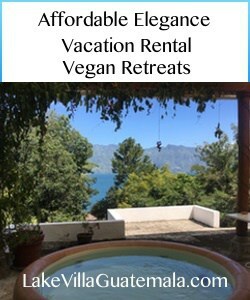 Based on advice from others in Guatemala, reviews, and their website, we stayed at Tortugal River Lodge. 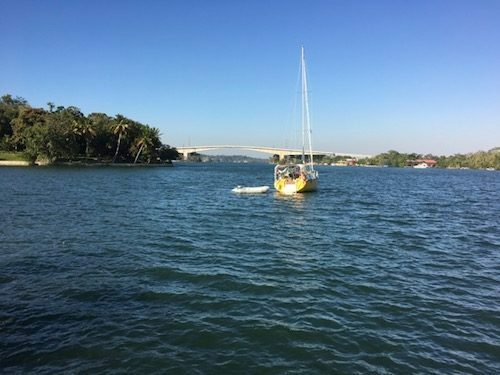 We left our car in their parking spot across the river, near the expansive bridge, and their private boat picked us up. We intended to explore more during our one full day, but we were exhausted and opted to relax on the comfortable patio of our casita. Our experienced at the Tortugal was mixed: if you want the full story, you can read my TripAdvisor review. We took one of the hotel’s kayaks to the Castillo San Felipe de Lara, where the Rio Dulce meets Lake Izabal. It’s an easy 20-minute paddle from the hotel, and best done in the morning before the wind comes up. The hotel restaurant was filled with cruising sailors from around the world swapping stories of their travels and boats. I might have enjoyed it more if the restaurant hadn’t been such a struggle. The short version is that their website advertised they cater to vegans but their staff had no idea what vegan means. (You can read about that in the review). We considered extending our trip to explore the area more, including the highly touted boat trip down the river to Livingston. 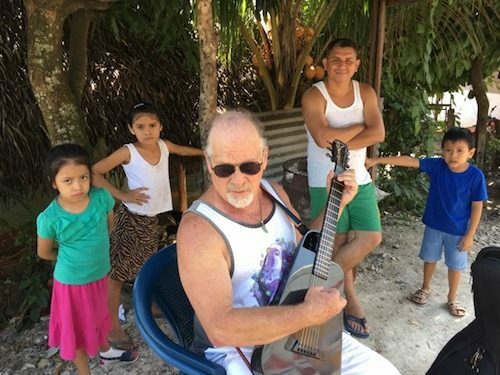 Mark had been there before and had no interest in going back, plus our travels had worn us out and we were eager to get home to Lake Atitlan. Our progress was quickly stalled by a protest that blocked the road for nearly two hours. We got out of the car to wait in the shade, where a local guy brought out chairs and opened coconuts for us to drink. Mark pulled out the guitar and we passed the time with music. Due to the protests and then road work, we had over three hours of traffic delays. We hit Guatemala City just in time for terrible commute traffic. Thank heavens for Waze, which deftly guided us around the worst traffic and to one of our favorite Guatemala City restaurants (Arbol de la Vida) in time for dinner. Our trip was both exhilarating and exhausting. It’s good to get away now and then, even when you live in paradise.